Good corporate governance is considered central to achieving the Bank’s objectives, and fundamental in maintaining a leading position within the local and regional banking sectors. BBK takes pride in ensuring exceptional standards of corporate governance are met. Our corporate governance policy is underpinned by international standards of best practice. BBK implemented initiatives in the first half of 2018 to fulfil its corporate governance strategy. The evaluation process for the Board and its committees was successfully completed and recommendations made for improvement. An action plan was put in place for short-term and long term recommendations. The role of corporate secretariat was expanded to include the Bank’s wholly-owned subsidiaries, and corporate governance norms in wholly-owned subsidiary companies were improved to meet that expected at Group level. Corporate secretariat also assumed responsibility for the secretariat of the Shariah Supervisory Board, so as to apply the same corporate governance norms for this committee. The Board reviewed the independence of directors through an annual exercise taking into consideration the regulatory requirements as well as best market practice. Many awareness programmes were arranged for the Board and Executive Management with the objective of continuous development and keeping abreast of updates in the Banking and technology sectors. BBK shall continue its endeavour to enhance shareholders’ value, protect their interests, and defend their rights by practising the pursuit of excellence in corporate life. The Bank shall not only comply with all statutory requirements – including the Corporate Governance Code of the Kingdom of Bahrain and the High Level Controls Module of the Central Bank of Bahrain – but also formulate and adhere to strong corporate governance practices. BBK shall continuously strive to best serve the interests of its stakeholders, including shareholders, clients, employees, and the public at large. The adoption and implementation of corporate governance is the direct responsibility of the Board of Directors, and this endeavour is in line with the policies of regulatory authorities and statutory requirements in the Kingdom of Bahrain and other countries where BBK operates. Risk appetite is the level and type of risk that the Bank is willing to assume to achieve its strategic and business objectives, keeping in perspective the obligations to its stakeholders. The risk appetite of the Bank is both a qualitative and quantitative measure and reflects its level of risk tolerance in normal as well as in stressed scenarios. It is expressed as a measurable key performance indicator (KPI), a tolerance limit, or as a qualitative guideline. The Bank has a well-defined Risk Appetite Framework, that consists of the Risk Appetite Statement along with: (a) well-defined performance metrics in the form of KPIs; (b) risk limits, exposure criteria, restrictions and controls, lending and investment standards as laid out in the internal risk policies and procedures manual; (c) capital and liquidity benchmarks, which are monitored in the Asset Liability Management Committee meetings; (d) key business and risk management objectives, goals, and strategy, which are defined in business, investment and risk management strategies; and (e) management and oversight structures in the Bank through Management and Board committees. Our risk appetite defines the desired performance levels, which, in turn, are embedded into management of the various risks within the Bank as well as the capital of the Bank. Our risk appetite is integrated into the strategic, capital, and risk management planning process across business verticals. 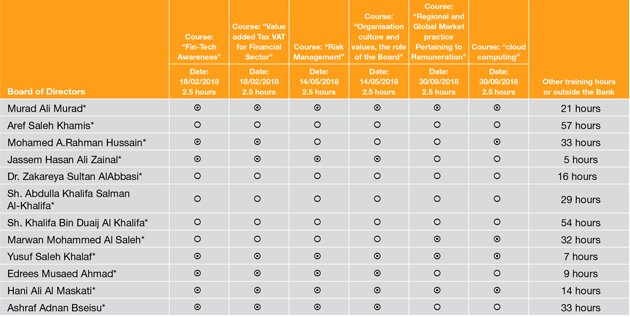 The Bank measures the contribution of each business vertical against KPIs. A high level of integrity, ethical standards, respect, and professionalism in our dealings. Taking only those risks which are transparent and understood, and those which can be measured, monitored, and managed. Ensuring that the Bank has adequate levels of capital adequacy on an ongoing basis as mandated by the regulator (currently 12.5 percent), and as assessed by the Bank in its ICAAP document; ensuring that the capital requirements and capital planning are incorporated in the Bank’s capital management strategy. Ensuring that the Bank has access to adequate levels of stable, efficient, and cost-effective funding to support liquidity and lending or investing requirements on an ongoing basis; that the Bank has in place a robust liquidity management framework and contingency plans to monitor and manage liquidity both in normal and stress liquidity conditions, in addition to monitoring key liquidity ratios (internal and regulatory) in Asset Liability Management Committee meetings on a monthly basis. Adhering to the core principles of lending, which are enshrined in the general lending policy of the Bank. Maintaining a robust credit management framework with focus on geographies where the Bank has physical presence (Kuwait, India, Dubai and Turkey), GCC, and select MENA and other countries; undertaking exposures to countries within the directives of the Country Risk Committee, which reviews country risk and the Bank’s strategy in those countries on a dynamic basis. Having in place a defined monitoring, collection, and restructuring framework for effective recovery mechanism. Limiting exposures to high-risk activities which may culminate in tail-end risks, jeopardising the Bank’s capital and creditworthiness. Striving for optimum profitability through income generation, cost efficiency, and low impairment. Widening the product basket and delivery channels for increasing customer satisfaction; assessing new credit products in a structured form for approval by appropriate authorities, so that the underlying risks, benefits, operational processes, system/technology requirements, and legal requirements are understood and managed. Protecting the Bank’s and the customers’ interests through robust operational procedures, internal controls, system support, training, and operational risk management processes to mitigate operational risk. Ensuring full compliance with legal, statutory, and regulatory requirements; ensuring adherence to anti-money laundering (AML) and other obligations under international law; providing adequate training and guidance to mitigate compliance and AML risks. BBK’s shares are listed on the Bahrain Bourse. The Bank has issued 1,081,647,952 equity shares, each with a face value of 100 fils. All shares are fully paid. The Annual Ordinary General Meeting (AGM) and Extraordinary General Meeting (EGM) were held on 20 March 2018. The EGM approved amendment to the Bank’s Articles of Association to be in line with the recent amendments on the Commercial Companies Law No (21) of the year 2001 in terms of Law No (1) for the year 2018. Minutes of both the AGM and EGM are published in the annual report. The Bank submits a corporate governance report to the AGM annually, covering the status on compliance with the related regulatory requirements. The Bank discloses and/or reports to the shareholders at the AGM the details under the Public Disclosure module of the Central Bank of Bahrain’s Rule Book. Such disclosures include the total remuneration paid to the Board of Directors, the executive management, and the external auditors. The total amount paid to directors and executive management is also contained in the annual report. The Board’s composition is based on the Bank’s Memorandum of Association and Articles of Association, and comprises 12 members. The Board represents a mix of high-level professional skills and expertise. Furthermore, in compliance with corporate governance requirements, the Board Committees consist of members with adequate professional background and experience. Consequently, the Board has five independent Directors. The Board periodically reviews its composition and the contribution of Directors and Committees. The appointment of Directors is subject to CBB approval. The classification of Executive Directors, Non-Executive Directors, and Independent Non-Executive Directors follows the definitions stipulated by the CBB. The current term of the Board began in March 2017 and ends in March 2020. Directors are elected/appointed by shareholders at the AGM. Experts who are non-shareholders or promoters of the Bank may also be elected as Directors. Election or re-election of a Director at the AGM shall be accompanied by a recommendation from the Board, based on a recommendation from the Nomination, Remuneration, and Corporate Governance Committee, with specific information such as biographical and professional qualifications and other directorships held. The Board is supported by the Group Corporate Secretary, who provides professional and administrative support to the General Assembly, the Board, its Committees, and members. The Group Corporate Secretary also assumes the responsibilities of the Group Corporate Governance Officer and in this context supports the processes of performance evaluation for the Board, the Board Committees and individual Directors, as well as the process of access to independent advice and other relevant issues on a Group level. The appointment of the Group Corporate Secretary is subject to the approval of the Board. BBK’s Group Corporate Secretary is Ahmed A. Qudoos Ahmed, who joined the Bank in 2009. His qualifications include a BSc in Engineering from the University of Bahrain in 1996. He is qualified in Board Secretarial practices from George Washington University and he has attended many advance training programmes in corporate governance both in Bahrain and abroad, accumulating over 22 years of experience in the financial sector. The Board of Directors oversees the implementation of the Bank’s strategic initiatives and its functioning within the agreed framework, in accordance with relevant statutory and regulatory structures. The Board ensures the adequacy of financial and operational systems and internal control, as well as the implementation of Corporate Ethics and the Code of Conduct. The Board reserves a formal schedule of matters for its decision to ensure that the direction and control of the Bank rest with the Board. This includes strategic issues and planning, performance reviews, material acquisition and disposal of assets, capital expenditure, authority levels, appointment of auditors and review of the financial statements, financing and borrowing activities including annual operating plan and budget, ensuring regulatory compliance, and reviewing the adequacy and integrity of internal controls. The Board shall exercise judgment in establishing and revising the delegation of authority for Board Committees and Management. This delegation could be for authorisation of expenditure, approval of credit facilities, or for other corporate actions. Such delegation may be approved and expressed under various policies of the Bank. The thresholds for the identified authorities will depend upon the operating requirements of the Bank. The issues of major capital expenditure, divestitures, mergers and acquisitions, and certain strategic investments would be within the Board’s authority. Each Director holds the position for three years, after which he must present himself to the Annual General Meeting of shareholders for reappointment. The majority of BBK Directors (including the Chairman and/or Deputy Chairman) are required to attend Board meetings to ensure a quorum. The Board Charter is published on the Bank’s website. Lending transactions to Directors, at a certain level of exposure, require Board approval. Credit and investment applications exceeding certain pre-defined exposure levels also require Board approval. Similarly, related party transactions involving members of the Board require Board approval. The Bank has procedures approved by the Board for allowing Board members to obtain independent professional advice relating to the affairs of the Bank or to their individual responsibilities as members, subject to approval by the Board. The Board is required to be up to date with current business, industry, regulatory, and legislative developments and trends that affect the Bank’s business operations. Immediately after appointment, the Bank provides formal induction for a full day. Meetings will also be arranged with executive management. This will foster a better understanding of the business environment and markets in which the Bank operates. A continuing awareness programme is essential and may take many forms, through distribution of publications, workshops, presentations at Board meetings, and attendance at conferences encompassing topics on directorship, business, industry, and regulatory developments. In terms of the Training and Competency Model of the CBB, each approved person (including members of the Board of Directors) is required to complete 15 hours of continued professional development. The Board performs a self-evaluation annually. The Board annually reviews its Charter and its own effectiveness, and initiates suitable steps for any amendments. The Board will also review self-evaluations of individual Board members and the Board Committees and consider any recommendations arising out of such evaluation. The relevant policy is published on the Bank’s website. 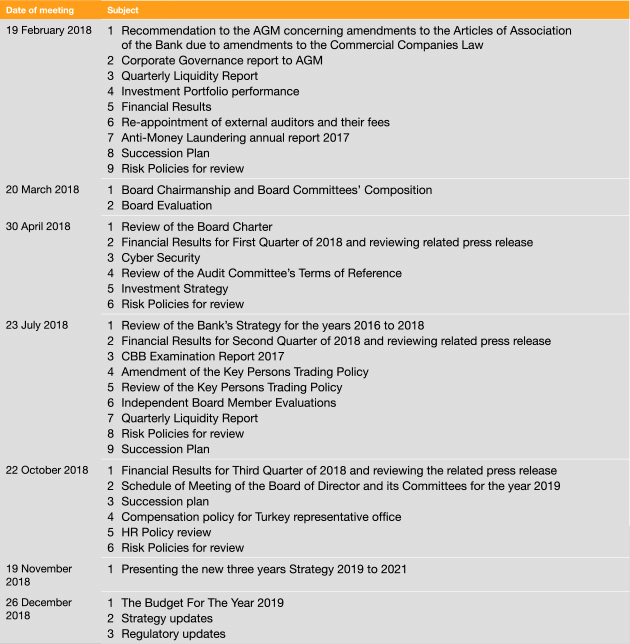 The Board has adopted a remuneration policy for Directors with well-defined procedures to apply to the Directors’ various remuneration and compensation components, reflective of their involvement and contributions in the activities of the Board of Directors and its ad hoc, temporary, and permanent committees. The basic guideline of the policy is that participation would be considered in terms of attendance at meetings. Participation in a meeting via telephone/video conference shall be considered as attendance of the meeting. The relevant policy is reviewed periodically to ensure it is in line with regional best practice. Directors’ remuneration is governed by Commercial Companies Law No 21 for the year 2001, and therefore all payments comply with the provision of the law. The Bank provides personal accident insurance coverage for Board Members during travel on Bank assignments. The Bank also has a liability insurance policy for Directors. The Bank has a whistle-blowing policy with designated officials whom the employee can approach. The policy provides adequate protection for the employees for any reports made in good faith. The Board’s Audit Committee oversees this policy. The whistle-blowing policy is published on the Bank’s website. The Bank has established a ‘Key Persons’ policy to ensure that key persons are aware of the legal and administrative requirements regarding holding and trading of BBK shares, with the primary objective of preventing abuse of inside information. Key persons are defined to include the Directors, executive management, designated employees, and persons under guardianship or control of Key Persons. Ownership of the Key Persons policy is entrusted to the Board’s Audit Committee. The Key Persons policy is posted on the Bank’s website. The Board has an approved Code of Conduct for BBK Directors. The Board has also approved a Code of Ethics for the Executive Management and employees. These codes outline areas of conflict of interest, confidentiality, and the responsibilities of signatories to adhere to best practices. The high-level responsibility for monitoring the codes lies with the Board of Directors. The Directors’ Code of Conduct is published on the Bank’s website. 1 Employment of relatives of first and second degrees shall be prohibited, whereas employment of relatives of third and fourth degree may be approved by the management provided it does not lead to a conflict of interest. 2 Employment of relatives at the Bank’s wholly-owned subsidiaries of first and second degree shall be prohibited for senior managers and above; any exception must approved by the Chief Executive. 3 As part of the annual reporting, the Chief Executive must disclose to the Board of Directors on an annual basis those individuals who are occupying controlled functions and who are relatives of any other approved persons within the Bank and its wholly-owned subsidiaries. The Bank has a documented procedure for dealing with situations involving conflict of interest of Directors. In the event of the Board or its Committees considering any issues involving conflict of interest of Directors, decisions are taken by the full Board/Committees. The concerned Director shall leave the meeting room during the discussion of these issues. These events are recorded in the Board/ Committee proceedings. The Directors are required to inform the entire Board of conflicts of interest (potential or otherwise) in their activities with, and commitments to, other organisations as they arise, and to abstain from voting on the matter. This disclosure includes all material facts in the case of a contract or transaction involving the Director. BBK’s contribution towards the well-being of the community is an integral part of its corporate role. This corporate social responsibility is translated by the Bank through annual appropriation of a budget allocated for donations to finance community-related projects and initiatives. The projects may vary in nature but ought to fall into any one of the following fields: charity, culture, research, education, philanthropy, environmental protection, and sports. BBK has an approved high-level donation policy for the distribution of the donation budget. The policy outlines guiding principles and sets criteria for the evaluation and selection of donation requests, with the ultimate objective of maximising the return on both the Bank’s social image and the benefit of the community. 1) Al Janabeya Company WLL (a family company owned by Mr Murad Ali Murad and his family) owns 987,825 shares, 91,326 bonds, and is related to the Chairman of the Board. 2) Arzan Financial Group – Board Member Mr. Jassem Hasan Zainal is the Vice Chairman & CEO of this group, that has a term loan facility with the Bank of KD 1.1 MM (BD 1.4 MM) maturing in May 2021. The Bank has a due process for dealing with transactions involving Directors and related parties. Any such transaction will require the approval of the Board of Directors. Note: 1) The materiality amount for such disclosures is considered above BD 100,000. 2) 7 Board members hold CrediMax Credit cards with a total limit of BD 97,100 and outstanding amount at the end of December 2018 of BD 5,649.014. 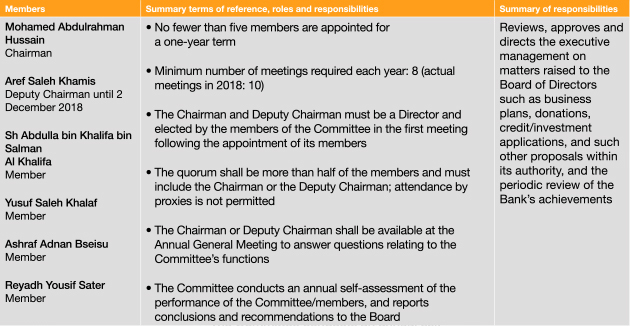 The Board of Directors meet at the summons of the Chairman (or Deputy Chairman in event of his absence or disability) or, if requested to do so, by at least two Directors. The Board meets at least four times a year. A meeting of the Board of Directors is deemed valid if attended by more than half of the members. Since 2012 the Board of Directors has held separate meetings for Independent Directors. In terms of the Board Charter, minority shareholders look to Independent Directors for representation. For this purpose, regular Board meetings are preceded by a meeting of Independent Directors, unless the Independent Directors decide that there are no issues to discuss. The agendas for this forum’s meetings are the same as those for the regular Board meetings. During these meetings the Independent Directors express their views about certain issues, especially those relating to minority shareholders. The summary of the proceedings of such meetings is recorded by the Group Corporate Secretary and shared with the Independent Directors. The Board Committees are formed and their members are appointed by the Board of Directors each year after the Annual General Meeting. They are considered the high-level link between the Board and the Executive Management. The objective of these Committees is to assist the Board in supervising the actual operations of the Bank, by reviewing any issues that are submitted by the Executive Management and making recommendations to the Board for their final review. The Board reserves the right to form temporary Committees and discontinue them from time to time, as necessary. Furthermore, members of the Board are provided with copies of the meeting minutes of the said Committees, as required by the regulators. There are no significant issues of concern to report relating to the work of the Board Committees during the year 2018. The Board formed an ad hoc committee during 2018 with the objective of enhancing the credit approvals process and framework. The full text of the Terms of Reference for Board Committees (Executive Committee, Audit and Compliance Committee, Nomination, Remuneration and Corporate Governance Committee, Risk Committee, and Independent Members Committee) are published on the Bank’s website. Mr. Murad Ali Murad, the Chairman of the Board attended the periodical CBB prudential meetings on the following dates: 5 February and 24 September 2018. Compliance with regulatory and statutory requirements is an ongoing process. The Bank is conscious of its responsibilities in observing all regulatory provisions and best international practices in its functioning. The Bank has established an independent compliance function in keeping with Basel and CBB guidelines. The unit acts as a focal point for all regulatory compliance and for adapting other best practice compliance principles. The Bank continuously strives to improve the level of compliance in all its activities. The Bank’s adopted corporate philosophy is: ‘BBK shall continue its endeavour to enhance shareholders’ value, protect their interests, and defend their rights by practising pursuit of excellence in corporate life.’ Anti-money laundering measures form an important area of the compliance function, in addition to areas of corporate governance, disclosure standards, insiders’/key persons’ trading, conflict of interest, and adherence to best practices. Starting from 2014, BBK began implementation of an automated compliance system for the monitoring and management of regulatory requirements across the Bank. This system facilitates the prompt reporting of any compliance concerns or noncompliance incidents as and when they arise. In 2017 and 2018, the system was rolled over to most concerned divisions as part of system overall implementation across the Bank. The Bank has documented an anti-money laundering programme, including periodic awareness training for employees, recordkeeping, and a designated Money Laundering Reporting Officer (MLRO). The AML policy and procedures are updated annually and were last approved by the Board of Directors in April 2018. The Bank has deployed a risk-based automated transaction monitoring system in keeping with the anti-money laundering regulations of the CBB. In September 2018, an upgrade of the Bank’s AML monitoring system was implemented. The Bank’s anti-money laundering measures are regularly audited by the internal auditors, who report to the Audit and Compliance Committee of the Board. The Central Bank performs periodic inspections of the Bank’s compliance with anti-money laundering regulations; the last AML/CFT examination by the Central Bank was concluded in October 2016. The annual inspection of the central bank covers all areas in the bank including Compliance and AML activities. Additionally, the Bank’s anti-money laundering measures are audited by independent external auditors every year and their report is submitted to the CBB. The overseas branches in India and Kuwait and the subsidiary, CrediMax, have designated compliance and MLRO functions to ensure implementation of local regulations and also to meet CBB requirements as applicable. The Bank is committed to combating money-laundering and, towards this end, implements all ‘Prevention of Money Laundering Regulations’ as stipulated in the Financial Crimes Module of the CBB Rulebook and other guidelines issued by the CBB. These regulations and guidelines are consistent with the revised FATF recommendations, ‘Customer Due Diligence for Banks’ paper of the Basel Committee, and best international practices. The Bank has an open policy on communication with its stakeholders, and has adopted a communication disclosure policy consistent with Basel II requirements. Shareholders are invited by the Chairman to attend the annual general meeting (AGM). The Chairman and other Directors attend the AGM and are available to answer any questions. The Bank is at all times mindful and conscious of its regulatory and statutory obligations regarding dissemination of information to its stakeholders. The Bank provides information on all events that merit announcement, either on its website – www.bbkonline.com – or through other forms of publication. The Bank’s annual report and three years’ financial statements are also published on the website, as well as the Bank’s Corporate Governance Report, Corporate Governance Framework, Whistle-Blowing Policy, Board Charter, Code of Conduct, Key Persons’ Dealing Policy, and Terms of Reference of all Board Committees. Shareholders can complete an online form, which can be found on the website, to forward any queries they may have. The Bank uses a bulletin board for communicating with its employees on general matters, and sharing information of common interest and concern.